This is Saarinen's most famous building. Helsinki’s major railroad station dated from the 1860s and, by the turn of the last century, it was obsolete. As early as 1904, the city planned to build a much larger and more modern station. [Eliel] Saarinen was selected to design the building. His original ideas called for a structure that would include medieval elements, traditional Finnish architecture and romantic elements. If you think about the major railroad depots being designed for major United States cities at the turn of the Twentieth Century such as New York, Washington and Chicago, you realized that their architects were quite strongly influenced by classical architecture. You often find Greek pillars and other elements of classical style. 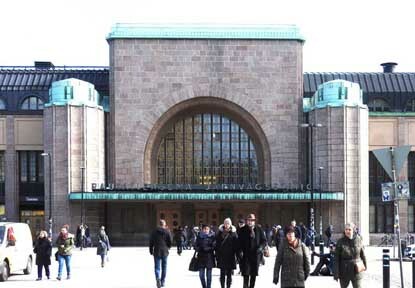 Saarinen’s station in Helsinki ranks, in terms of architectural ken, with the most impressive stations in this country but you realize that it involves modern architecture, not ideas borrowed from Roman and Greek designers. The first railway station in Helsinki was built in 1860, as Finland's first railway between Helsinki and Hämeenlinna was opened. The station's plans were drawn by the Swedish architect Carl Albert Edelfelt. However, as the popularity of railways grew, the station turned out to be too small, and a contest was organised in 1904 with the intention of producing plans for a new station. The contest received 21 entries, and was won by Eliel Saarinen, with a pure national romanticist design, which sparked off a vigorous debate about the architecture of major public buildings, with demands for a modern, rational style. Saarinen himself abandoned romanticism altogether and re-designed the station completely. The new design was finished in 1909 and the station was opened in 1919.